After six test drives and researching a dozen websites, you've finally decided on the Toyota Camry Hybrid in Sky Blue Pearl with the navigation package. You shake hands at the dealership or accept one of the online quotes from Edmunds.com. So what happens next? Chances are, your car arrives with hundreds of others aboard an enormous automotive cargo ship at Port of Richmond, one of the largest seaports in America. The Port of Richmond's 18 terminals receive up to 23 million tons of goods annually. Along with vehicles, the majority of the cargo is oil and other petroleum products. 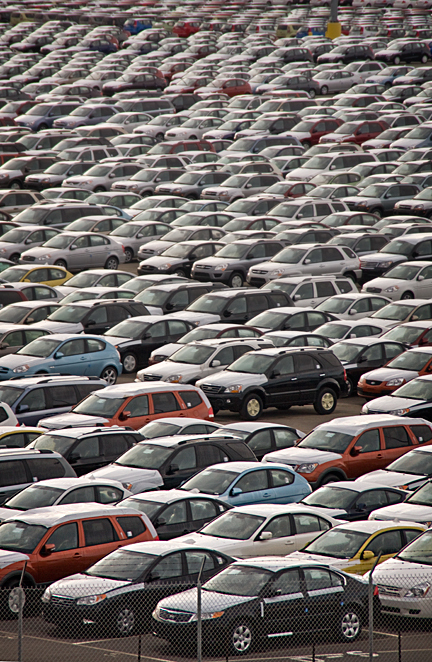 Like a trail of ants, the cars are driven out of the ship's vast cargo hold by an army of dockworkers and your Camry is parked in an assigned spot dockside with thousands of others awaiting transport. The Port of Richmond is served by a vast rail network operated by four major rail companies including the Union Pacific Railroad and the Richmond Pacific Railroad. Your new car is then loaded, three-high, into automotive train cars and shipped to a depot near your dealership where it is cleaned and prepped. It is there that you pick up your new car, look at the invoice, and quietly decide that the 'destination charge' is a big scam.